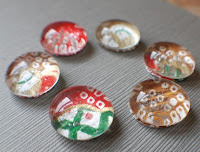 This week's giveaway is sponsored by another great etsy shop. Can you tell I'm addicted to etsy?! I know that some of you have told me that I have made you addicted to0. Well here's another way to get your etsy fix. Enter this week's giveaway because you love handmade things and because your fridge loves magnets. Visit her etsy shop HERE and check out all the different magnets. Then come back here and leave a comment about which one is your FAVORITE set of magnets. They all have different cute names so that when you win you get the set you wrote about in your comment. You have until Tuesday of next week July 15th to enter the giveaway. Good luck! I don't like being the first to comment- #1 never wins anything. I looked through and thought there'd be nothing that matched my kitchen, but there is- Mickey Mouse! Those are so fun! Without a doubt its the international mark magnets!!! I'd love to enter if Canadians may. The Snowflakes magnets are my favourites. Aww, I have made these before but never as cool as these ones. How fun! maybe i could use some of my japanese washi to make magnets. if i had access to glass stones and magnets. no craft stores here. count me in on the giveaway. I like the Spotty - Glass Pebble Magnets or the Frilly - Glass Pebble Magnets and the Mickey Mouse - Glass Pebble Magnets. Since I can only choose one - I will go with the Mickey Mouse - Glass Pebble Magnets. So many to choose from. With a 6 yr old who loves DORA, its gotta be Dora the Explorer magnets in our house. Thanks for the giveaway! Oooo, I love magnets! The silver sparkles ones please! the turquoise ones are lovely!!! I like the one called bubbles- totally my style. that is nice that they come in everyone's style. All of them are really cool. Harley is cool too- halloween looking but cool. They are all so cool... it was really hard to pick one design! I would have to go with the road trip magnets though b/c they seem fun! 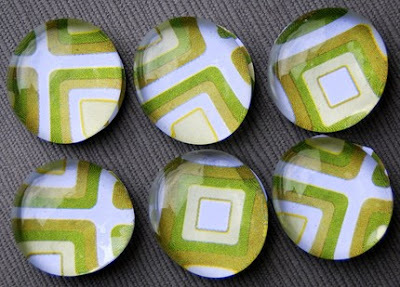 I really love the "Bubble" magnets, tres artsy and funky! The kid in me loves the "Spongebob" ones too!! I have a love for magnets! Damaris, thank you so much for invite me to see your blog. And I loved everything that I saw here. And I think I am going to be addicted too! Hahaha I loved everything, but he one that I liked more was the pink and green polk. I wish I win let’s see! Kisses and I hope everything is okay with you and your beautiful family. I love the Here Fishy, Fishy ones. Those are so cute. Okay. No freedom apron but maybe, just maybe a magnet? Sounds great! 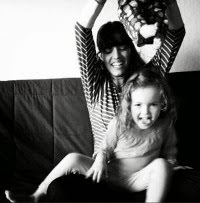 Damaris, your blog is amazing! Besides having great recipes e ideas, it has giveaways! How awsome is that? Thanks! I love the Peace ones - and I'll be going back for some holiday shopping I think! They ARE a lot like my magnets aren't they?...very cute! I would love to win them. please. please. pretty please. The mickey ones! Oh how cute and we LOVE Mickey!! Roadtrip - Glass Pebble Magnets - altho I really had a hard time deciding. I just love all the different magnets. They are just beautiful. 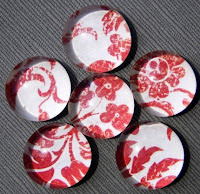 I really like the Sassy - Glass Pebble Magnets - Set of 6 - Rare Earth. Wow they are all very beautiful. I would let you choose which to 'giveaway'. Nice job!! Well I just ordered the pick yer favs pack cause I liked too many to pick just one. I have a giveaway going on at my blog too.. check it out if you get a chance! I love your work.